It is the marketing equivalent to The Field of Dreams— if you build it they will come. But really, WHAT DOES BETTER CONTENT EVEN MEAN? Does it have more keywords? Or use a specific structure? Does it have more links? I’m not making this less frustrating, am I? It is clear that good content matters. It has been driven into our heads for the past decade or so. It is pretty clear that content matters, but there is no simple answer as to what makes content great. However, there are ways to improve the quality of the content you produce, for both your audience and the search engines. Good content for a person researching Linux hosting plans is going to be different from a person looking to purchase a Fitbit. Good content for a pool cleaning company is going to be very different than good content for an e-commerce makeup brand. Add engaging features like tables, charts, videos, etc. Let’s look at each of these steps in more depth. Way back in 1997, the Nielsen Norman Group reported a striking difference in the way people read online versus how they read printed materials, like books. Quite simply, people don’t read, they scan. Twenty years have passed, but the way people read online hasn’t changed. Increasing the number of useful headlines in your content serves two purposes – it makes it easier for readers to find the information they need, and it also helps Google better understand your content. For the uninitiated, heading tags are hierarchical HTML elements. In general, h1 is reserved for the title of a post or page, followed by h2, h3, h4, h5, and h6, each with descending levels of significance. According to Google, the use and optimization of title tags is one of the 200 ranking factors considered in search results. Here are a few best practices for adding more headings, without sacrificing quality. Add key terms to the beginning of your headings when it makes sense to do so. Use the tools and best practices in the next section to make your headings and titles even better. In the age of Twitter and Facebook, you have just seconds to grab a reader’s attention before they are on to the next distraction. Your titles and headings need to be engaging if you want to keep eyes on your content. I mentioned adding more headings above, and that is important. But quality matters, too. In fact, I would argue that quality matters more. One hundred boring headings won’t keep readers on your page. Ten amazing headings will. The tools below will help you write better headings and figure out which ones are performing better. Answer the Public: Search your topic to find out what questions people are asking about your topic. Ask those questions in your heading and answer them in your content. CoSchedule Headline Analyzer: Run you headline through CoSchedule tool to find ways to make your headlines better. This tool looks at length, the types of words you use and much more. Thrive Headline Optimizer: This WordPress plugin makes it easy to test multiple headlines and then chose the winner based on what data matters most to you: time on page, scrolling, or click through. 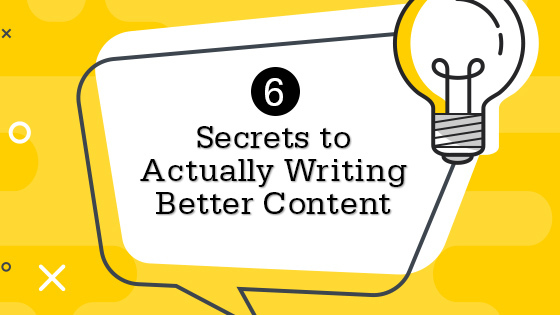 Increasing the length of your content is one way to write better content. BUT there is a massive caveat. Using five words when one will do does not make for better content. Adding unrelated information does not make better content. Adding more words doesn’t make better content; adding more relevant information does. In a Reddit AMA in early 2018, John Mueller, webmaster trends analyst at Google, specifically said there is no minimum word count. Comment from discussion I am John Mueller, Webmaster Trends Analyst at Google. AMA. The goal of increasing your word count is to create a comprehensive piece of content, not to game the system. Try to answer any questions users might have. Provide real, useful information — not just fluff. To do this, I recommend looking at related searches in Google and searching for related key terms for inspiration to flesh out your content. Keep in mind, there is absolutely a place for short pieces of content. I am not recommending you write a 2,000-word product descriptions for a pack of ballpoint pens. What I am recommending is adding more relevant information to your content where it makes sense to do so. Free Keyword Niche Finder: Use WordStream’s free tool to find related key terms and include them in your headings where it makes sense. Market Muse: Most of the tools I recommend are free or have limited free options. This one does not, however it is incredibly useful. MarketMuse uses machine learning to compare your content to your competition and shows you how to improve yours. Writing better content often means writing longer content, which can become overwhelming to readers. Remember, the goal is to create a more useful piece of content, which is where Table of Contents come in. If you don’t find it right away, there is a good chance you will head back to the search results to look for an easier-to-navigate piece of content. 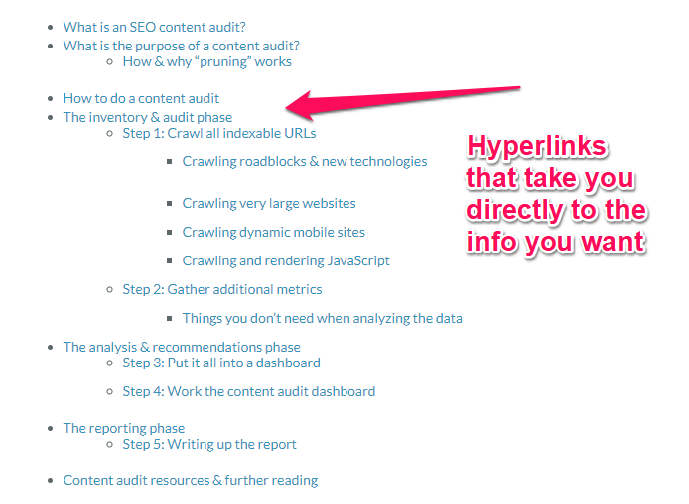 A great example of a good ToC is Moz’s content audit post. 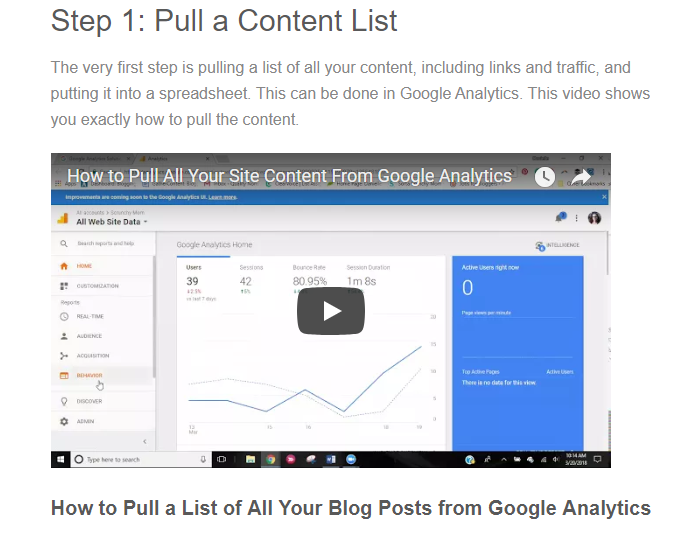 Adding a table of content is simple (I will share a few plugins you can use below), and it helps create easier to navigate content, which may result in increasing time on page. The risk benefit ratio means it makes sense to add ToC to longer pieces of content. You can build a ToC manually in most CMS using unordered lists, but there a few WordPress plugins that make it super simple by using h tags. You can usually customize what levels of h tags to pull as well. Adding images to your content isn’t a new strategy. You likely already know that adding images helps your audience better understand your content and keeps them on page longer. If not, take a look at this study by Backlinko which shows a correlation between images on a page and ranking. The takeaway here is to not just add images to add images. Terrible stock photos aren’t going to do you any favors. Use a tool like Skitch to take and mark up screenshots. If you do use stock photos, use a tool like Canva or Snappa to make it your own. In addition to adding better images, you should also be optimizing your images for Google. Here is a quick run through on how to do that. Use the smallest image size possible without compromising quality. Use descriptive file names, titles, and captions. Include key terms when possible. Be sure to include alt tags, and use key terms when possible. Add structured data (for products, videos, or recipes) if it makes sense for your image. Those are the basic image optimization techniques you will need, for more in-depth information I recommend visiting Google’s site for their Image Publishing Guidelines. There are a variety of tools you can use to create beautiful graphics. When we think of content, most of us think of words and maybe pictures. In fact, there are dozens of different types of content, including video, sound files, lists, tables, GIFs, and charts. Adding these elements, particularly multimedia content like video and sound, is one of the best ways to set your content apart. Presenting content in a variety of formats helps keep your readers engaged, increasing time on page, clicks, and social shares. These things are all good for telling Google your content is relevant. Presenting the content in multiple ways also helps people who may not absorb information well through written words understand your content. Here are a few ideas of diverse content to use as inspiration. Say you are writing a blog post about how to increase organic traffic. Instead of just writing out the step by step instructions on how to pull a specific report from Google Analytics, use Zoom to record your screen as you do it. For many users this will be easier to understand. 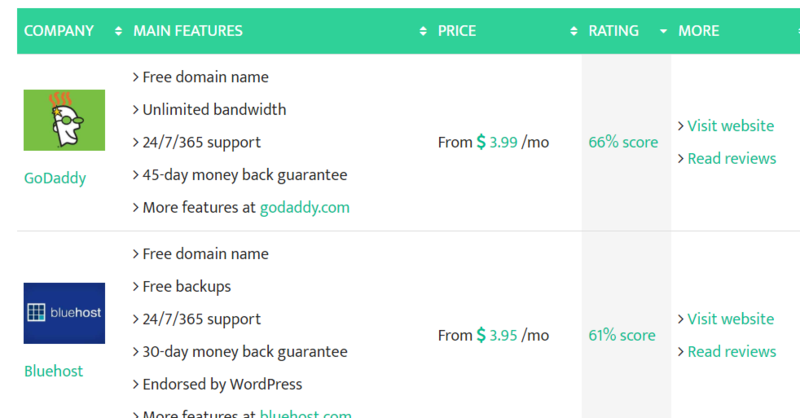 Or, say you were writing an in-depth post comparing two hosting options. You could include a table comparing the hosts side by side. This one even allows users to sort by features, price, or rating. 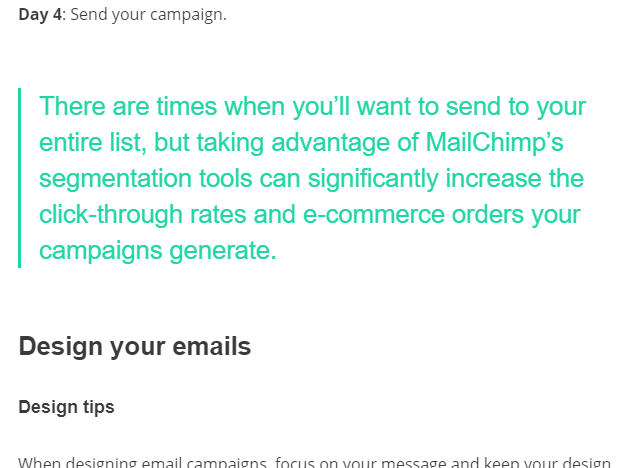 To make important information stand out, you can use pull quotes, like MailChimp did in their Email Marketing Guide. There are dozens of ways you can add content in different formats. The tools below will help. Table Generator: Most CMS make it simple enough to create a table, but you can also use this tool to code tables. Giphy: Use this to turn your videos into GIFs. Zoom: Use Zoom to record your screen, then upload the video to YouTube and embed the file in your post. Part of what makes it so difficult to create ‘great’ content is there are so many different ideas about what makes content useful. Not all of these tips will apply to every brand or every piece of content. That is okay! Take what works from this list and use it to create better, more useful content for your audience.